Small credit unions are being consolidated or liquated at the most rapid pace in credit union history. Saving the remaining ones will need assistance from big data. 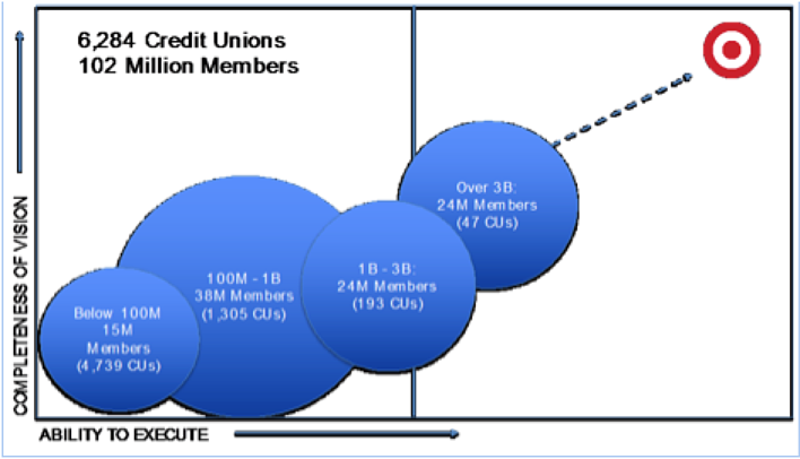 As of Q2 2015, the credit union movement in the United States was made up of 6,284 credit unions and 102 million members. However, smaller credit unions (those with under $1 billion in assets) are closing their doors at a rapid pace. Unfortunately, they are the institutions that serve the majority of credit union members. Utilizing big data will give small credit unions the tools they need to overcome economies of scale, new regulations and inadequate data volumes that currently give big credit unions and large banks a competitive advantage. Large credit unions and banks have an advantage over small credit unions because they are able to hire more employees who specialize in different areas of big data and analytics. Having a larger team allows them to take full advantage of their data. For example, assigning experts to each business database gives big credit unions and banks the ability to develop and execute strategies around an enterprise vision of their data. As a result, large credit unions and banks have a more complete vision and the ability to execute it. Regulators are continuously requiring more robust data from credit unions. In order to meet the data demands of regulators, credit unions must begin to strategically store their historical data. Small credit unions will be hit the hardest by new regulations since they already have low staffing levels and smaller data sets. All the work required to prepare for new regulations will drain the staffing capacity for productive work. The amount of data that big credit unions are able to collect can be intimidating. Storing terabytes of data allows larger competitors to make better predictions. A larger sample size gives these competitors the luxury of making decisions based on an abundance of data. With smaller data sets, small credit unions will not be able to build predictive analytics accurately. CECL will require a plethora of data for predicting future activity on the loan portfolio. Through strategic use of three 3rd party data sources, small credit unions can leverage data to bridge the gap with the larger competitors. Industry Data – Credit union industry associations, such as Callahan & Associates, offer data from credit union’s Call Reports and various other sources. Tapping into their data gives credit unions the chance to utilize big data (currently not stored within their organization) from associations that truly understand the credit union movement. For example, understanding the loan portfolio of credit unions located throughout a community will give credit union leaders a better vision for growth and expansion in the future. Public Data – Freely available public data has never been more abundant. Finding data on demographics about a community can be integrated with the credit union’s internal data. Identifying economic trends, government spending decisions and recent home sales are a few examples of how big data can give small credit unions fresh insight. Companies like Idea5 have a vision to integrate publically available data into credit unions’ strategies. Strategic Data pooling – Utilizing an industry standard data pool will allow credit unions to share data from the sources they currently store only internally. Through data encryption, the credit union industry is beginning to find ways to securely pool their data with like-minded credit unions. In order to construct better forecasting models, credit unions need more data. Sharing transactional data directly from its source system will give small credit unions a level playing field with big credit unions in forecasting the future. With the CECL model, credit unions should look for ways to improve their forecasting capabilities. Also, the cost of data experts is beyond most small credit union budgets. By pooling data and cooperating to develop predictive analytics, credit unions can have access to an abundance of data and the experts to build predictive analytics. The credit union movement needs big and small credit unions alike. In order to unite all credit unions, the playing field should be leveled through technology that is made affordable by CUSOs. By utilizing big data, small credit unions can thrive. The cooperative spirit that began the credit union movement, coupled with a deep understanding of members and the local community, will enable small and large credit unions to work together in their common vision of serving local communities with ethical financial products.